2.Can add a additional front/rear view camera to current system. 3. The monitor screen can set default start up/off auto when power come on/off,We provided a charger adapter on/off switch to control. 6. The system can be set up to work in reversing or constantly in driving by you. 8. The monitor can be mounted on dash or the monitor mount is removeable to hook anywhere you like,if you need a Suction cup mount for windshield,contact us to get a free one. 9. We provided instructions manual and video for all customer,contact us if you didn't get it. Very easy installation . 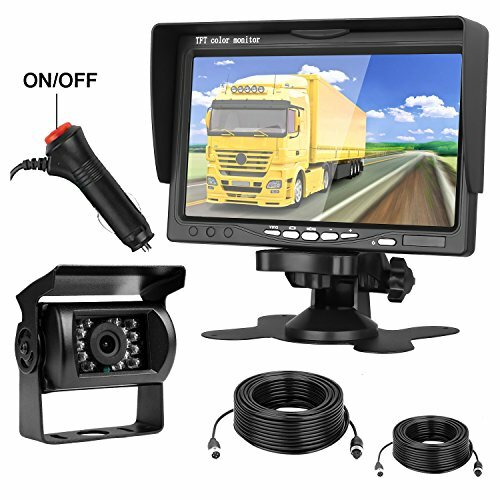 Back up camera is connected to monitor direct by 43ft+23ft video cable,the two 43ft and 23ft can be connected and disconnected with a connector. Rear camera:IP68 waterproof with 7 LED lights 18 infrared lights , Vision view clearly at night,150 degree wide viewing angle. Monitor has capability to monitor two video inputs V1/V2. V2 video input will have priority (reverse camera) for safety by connecting blue wire to power positve or you need switch between v1 and v2 by manual. The monitor can be mounted on dash or the monitor mount is removeable to hook anywhere you like. If you want a suction cup mount for fix on windshield, contact us get a free one. If you have any questions about this product by iStrong, contact us by completing and submitting the form below. If you are looking for a specif part number, please include it with your message.